This week I got rid of 78 items! First, I sent a box of 28 items to Alabama for the online tornado relief drive organized by Couponing to Disney. Two of those items were toiletries; the rest were baby girl 3 to 6 month and boy size 5 summer clothes my kids had outgrown that I hadn’t listed yet on eBay. I was happy to both declutter and help families in need. Next, I sent 13 maternity and baby clothes to my cousin who is expecting a baby girl this summer. 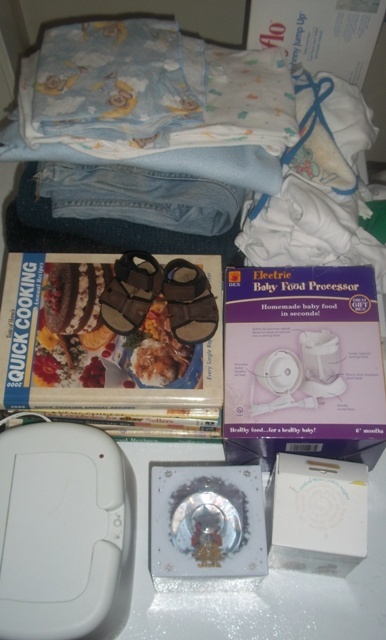 Finally, the remainder is what I have in the picture, 37 items that are headed to the garage sale pile (which seems more like a mountain now). A lot of it is stuff my youngest continues to outgrow along with cookbooks I never use and sweaters my husband no longer wears. Have you been decluttering? Feel free to share your successes in the comments. Thank you for the donations to tornado victims! I was glad to help. I can’t imagine the devastation and how difficult it will be to start over. That’s awesome! Go you for not only decluttering but making it useful and helpful to those in need as well. I have a goal of 1000 things this year myself – since I live in a small townhouse and don’t have kids, 1000 items is a stretch, but I’m determined to make it! I am amazed how quickly it adds up. I think we might be at 2000 or 3000 before we are done!